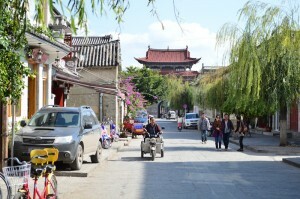 When visiting Lijiang in Yunnan recently as part of our motorcycle tour of every province in China I was surprised by how charming it’s old town was. 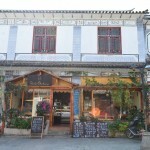 Yes, it had the usual horde of hawkers shouting their unauthentic, mass-produced wares to anyone passing their shop. Yes, the crowds were astonishing for anyone who hasn’t grown up surrounded by a population of 1.3 billion. Yes, the buildings were adorned with more lights than is considered decent, and yes- well, you get the idea. 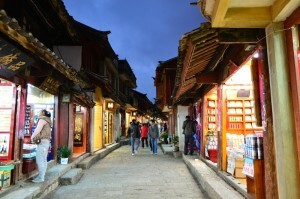 Lijiang is like many other touristy old towns. And yet it was charming. I put this down largely to the city’s preservation and restoration efforts of the traditional architecture. Lijiang is the old capital of the Naxi (or Nakhi) peoples and in its heyday (some 800 years ago) was a centre of trade between China, Tibet, India and several south-east Asian countries. Originally believed to have come from the north-east of China, the Naxi people seem to have adopted much of the Han style of architecture. 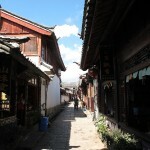 Most of the buildings are one or two story, three or four roomed courtyards with a front screen wall. 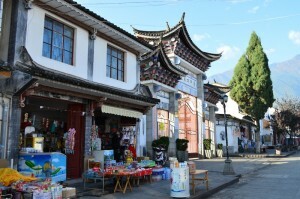 The buildings in Lijiang are a mixture of store fronts and merchant homes from basic adobe and timber dwellings to elaborately decorated courtyard houses. The structural frame is timber with first floor walls of adobe, painted in a lime-wash. Corners are decorated in grey brick panels and second storey walls are made of timber planks. Many properties have white screen walls decorated with inlaid carved tiles. 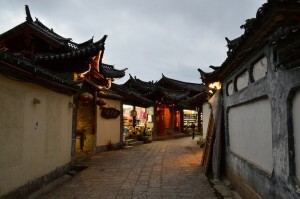 Roofs are also constructed of timber and covered in grey, semi-circular clay tiles with overhanging, upturned eaves in the typical style found in southern China. Foundations are stone. Some windows, especially on the first floor, had elaborate geometric lattice work and timber screens hang over shop-front openings, allowing the store to be entirely opened to the street. The Naxi people are expert wood carvers and timber elements are often elaborately carved and decorated, as are window and door frames. 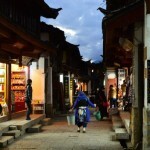 Wandering the crowded streets you do get a sense of what a political, cultural and commercial old town like Lijiang might have felt like. 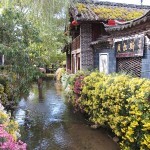 The old warren of streets follow meandering waterways, designed in such a way to provide a basic form of sanitation as well as to promote favorable feng-shui. Part of the old town wanders up along a mountain slope, adding some interesting layers and steep stone steps to the street-scape. 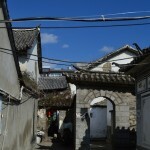 Uneven and narrow cobble stone alleys and small stone bridges further add to the dense atmosphere of a historic town. Today’s crowds, loud noises and a variety of street food smells would all also have been present back then. One element that has clearly been recently introduced (which in my opinion is distracting and more than a little overkill) are the large number of potted plants and flowers lining the streets and crammed into every free corner. At a guess I would say these have been added to further “beautify” a place geared mainly to Chinese tourists. 2) Lobby for a UNESCO World Heritage listing (China is applying for these left, right and center at the moment, and it’s not a cheap undertaking either). 4b) Lease out the places to shop owners and business people willing to pay the higher rents, usually from other parts of the country. This is not to claim that government agenda for cultural preservation is a soulless and cold-hearted business, it is simply to state that it IS a business. 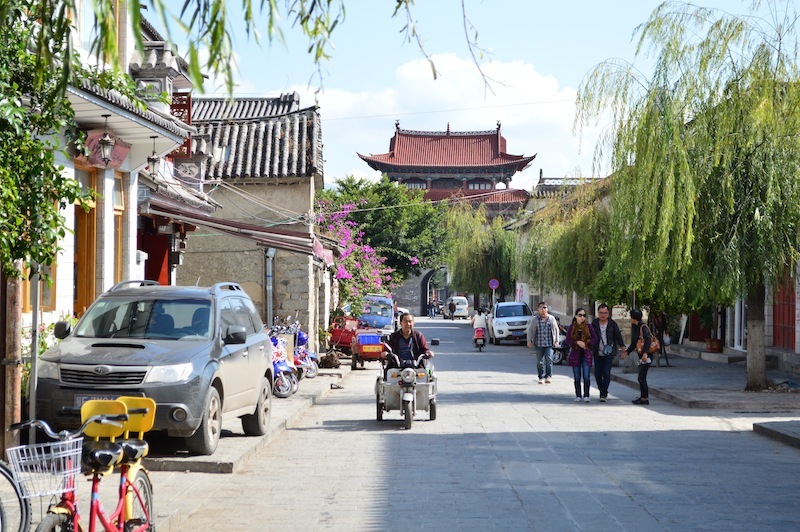 Having a UNESCO World Heritage listing on an area, relic or cluster of buildings greatly improves chances for increased tourism in that area. 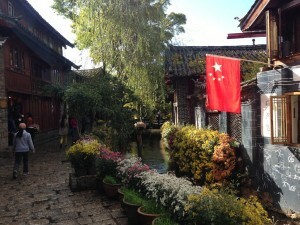 Chinese tourists want to see the best, and that is what that plaque represents. Having said that, in the absence of a UNESCO World Heritage listing some historic sites seems to be going down their own path of cultural preservation. This alternative could be said to be more akin to the natural evolution process of a community, whereby the preservation of a building or area is almost a by-product rather than the end goal. 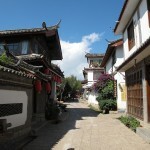 This is what I found when we visited Dali Old Town, also in Yunnan and only around 130km from Lijiang. 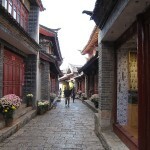 Dali has a very different feel from Lijiang. For a start it was, and still is, home to the the Bai ethnic minority. 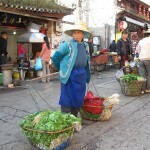 It seems the locals here still occupy much of this town and go about their daily business much as they always have. With more of a bohemian feel, Dali certainly hasn’t escaped the tourists, however somehow the atmosphere is more relaxed than in Lijiang. 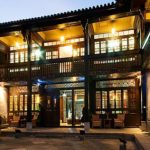 The architecture is quite a mix of old and new; from simple, adobe and timber-clad single storey structures, to multiple story stone and brick structures with elaborate stone carvings embedded in the facades. Streets and alley ways are lined with small boutique businesses, hostels, bakeries and coffee shops, adding to the hip, casual vibe. 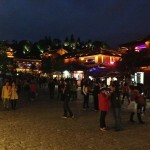 There is also a noticable difference in the layout of the town, which follows a grid structure, compared to that of Lijiang which is very organic. An earthquake in 1925 destroyed many buildings and parts of the city wall, which might account for the wider, more structured road layout. This could also be a reason why Dali Old Town is not on the UNESCO WH list (although it is trying), as despite it’s longstanding history many of the buildings are simply not that old, or have been “restored” to such a degree that they look entirely new. 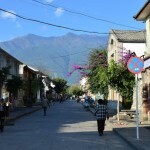 Dali was the seat of the Bai kingdom which flourished during the 8th and 9th centuries, and became it’s own kingdom (the Kingdom of Dali) from 937 – 1253. 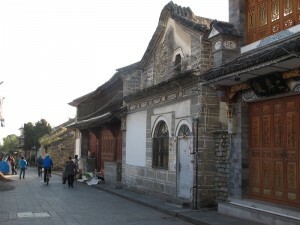 The old town is claimed to be a gateway for the southwest section of the Silk Road. Bai architecture also has some of the Han characteristics found in Lijiang; U-shaped 3 part structures with internal courtyards, the fourth side consisting of a decorated screen wall. More elaborate buildings will have several sets of courtyards. The buildings are usually two stories tall. 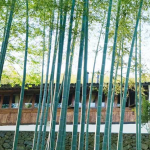 Traditionally therefore the screen wall should face east to reflect the morning sun into the property (although this is not a fixed rule as in some areas the screen wall faces south-west or west to reflect the late afternoon rays). Bai architecture has some other distinctive features. 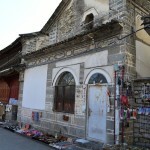 For example, a main doorway will often be sheltered by an elaborate portcullis consisting of multiple layers of painted, interlocking timber brackets, called dougong (斗栱), which support a tiled roof with upturned eaves. 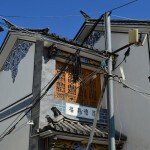 White, lime-washed facades are also often decorated with elaborate paintings of phoenixes and dragons or single characters for luck and good fortune, in shades of blue and grey. 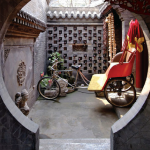 As there is no UNESCO WH listing on Dali, there are no regulations beyond the local planning requirements for new builds and home improvements. Without proper guidelines there is no denying that it’s a mixed bag when it comes to the preservation and/or restoration of Dali’s buildings. Many buildings have undergone DIY- type modifications where larger, unwieldy spaces have been converted to more manageable-sized businesses. 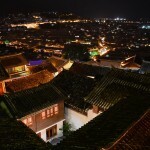 However, by and large an effort is being made to maintain a similar architectural style throughout the town. Newer buildings are designed in the same fashion but with bolder facade decorations, sometimes using a mixture of Bai and Tibetan symbols. In the morning walking past local farmers from the surrounding countryside selling vegetables from their baskets to locals in the middle of the high street, you get a sense that people here do care about maintaining their way of life, even if it might partly be due to the promise of more tourists visiting their historic town in the future. It seems to me that not having a UNESCO WH listing, in some ways, has done Dali a favour. Tourism is on the the rise, but at a manageable pace, allowing locals to adapt to the changes. Yes, the architecture might suffer more than if it were under full protection, however the overall feel is of a living historic town, rather than a museum. 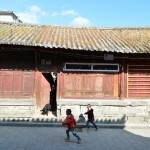 Additionally, as I’ve come to witness with UNESCO WH towns in China, having the listing does not guarantee good restoration and preservation practice. For more information on how historic towns deal with UNESCO WH listing, visit this “UNESCO WHC-ICOMOS Reactive Monitoring Mission to the Old Town of Lijiang, China” link and download the PDF report.